Gougeon Brothers, makers of WEST System and PRO-SET epoxy resins and related products such as fillers and disposables, recently announced that its Epoxyworks newsletter now has 500 articles online at epoxyworks.com. First published in 1992 as a resource for customers using their products, it features many how-to articles, most, but not all, related to boats. Epoxy, after all, is equally useful around the home and business for fixing just about anything from broken pottery to a broom handle. Besides layup of hulls and parts, epoxy is useful for myriad repairs, such as delaminated deck skins and cores. The crew would be her. “I did all of the updating. It took me approximately forever,” Ombry said kiddingly. But an important job well worthwhile. 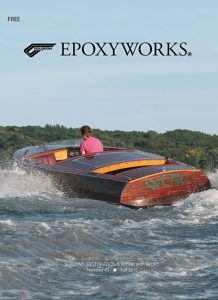 Subscribe to the free digital edition by supplying your name and e-mail address on the epoxyworks.com website. Ombry said their e-mail list is never shared or used beyond the newsletter.